Shu Min moved to New York City from a small village in China with her family at the age of 13 knowing no English. She immediately saw education as her key to unlocking a stronger future. Throwing herself into her studies, Shu became fluent in English in two years. Since then she has mastered the language, maintained a solid A average, and fully immersed herself in various clubs and activities. College has been her guiding light. Unfortunately, Shu struggles to help her parents understand her focus on higher education. “In addition to language barriers, my parents’ lack of education makes them doubt the value of school involvement,” she says. Seeking a place to explore her options – and a support system to guide her – Shu found The Door. 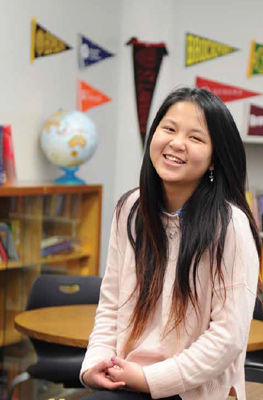 Working with the Talent Search program, Shu went on regular college visits, and received support applying for a scholarship that got her a full-ride to Haverford College. And when she was recently selected to participate in a leadership workshop at Harvard, The Door helped pay to get her there. “The Door opened my eyes to so many possibilities,” she says. 50% of the college population is made up of students whose parents did not receive higher than a high school education, with minority groups making up the largest group. The Door’s Talent Search provides the extra support that many first-generation students need, sending 92% of participating kids to college every year.